The number of window treatment options available these days is huge compared to the situation even a couple of decades ago. These days, blinds made of metal and composite materials are quite popular among homeowners. However, the traditional wooden window blind continues to find favour with a lot of people. That is because wooden window blinds have their own unique set of advantages and selling points. For instance, wooden blinds are eminently versatile and elegant and sport a classic look that can warm up the demeanour of any space. But with numerous window treatment (besides metal and composites) options at your disposal, you could very well wonder if going for wooden window blinds, instead of other cheaper variants, is a good idea. This is one of those situations where the saying ‘you get what you pay for’ fits perfectly. The high price of wooden blinds gets you benefits that other types of window blind materials just cannot stand up to. With that, here we look at four reasons why you should go for wooden window blinds. The window blind was born out of the need for greater privacy, which was something that curtains couldn’t ensure completely. This is why all window blinds are very good as far as offering privacy is concerned. However, wooden window blinds are the numero uno in the privacy department thanks to their tight seal and thickness. Blinds created from other materials simply don’t stand a chance here as wooden blinds do not betray even an inkling of movement or shadow to the outside world. The attributes that enable wooden blinds to offer such fantastic levels of privacy also have a more practical consideration. They are excellent when it comes to providing light control and insulation. With wooden blinds, you can control how much light enters your home. And thanks to its insulating properties, your home becomes more energy efficient as well. Because of their cost and natural origins, there’s a belief that maintaining wooden blinds is a tall order. However, nothing could be farther from the truth as they are one of the easiest blind types to clean and maintain. To put things in perspective, blinds made of certain composite materials are very tough to clean if they collect a lot of dirt and grime and usually need to be taken down from the windows and washed thoroughly. While window blinds made of wood can accumulate a lot of dust as well, they are infinitely easier to clean. This is because grime and dust don’t stick to the wood and can be simply wiped off using a slightly damp cloth. The only thing you need to be careful is to ensure the wooden blinds dry completely before you put them back. This is important because moisture can damage the wood. As such, wooden blinds are not a good idea if you live in a perennially humid region and should not be installed for spaces like kitchens and bathroom. Because of their natural origins, wooden blinds are highly versatile options for window treatment and can be created in an assortment of styles and sizes. You can have wooden blinds made for a window of any size. You can also take your pick from an extensive range of woods and have them stained in a manner that complements your home décor. There’s also a practical side to the versatility of wooden window blinds. Of all the different window treatment materials, wooden blinds are by far the lightest. This makes them perfect if you have large windows in your home. The lightweight ensures that you are able to open, close, raise and lower them with the least amount of effort irrespective of the size of your windows. As previously mentioned, wooden blinds continue to find favour with homeowners in spite of the advent of other window treatment options. 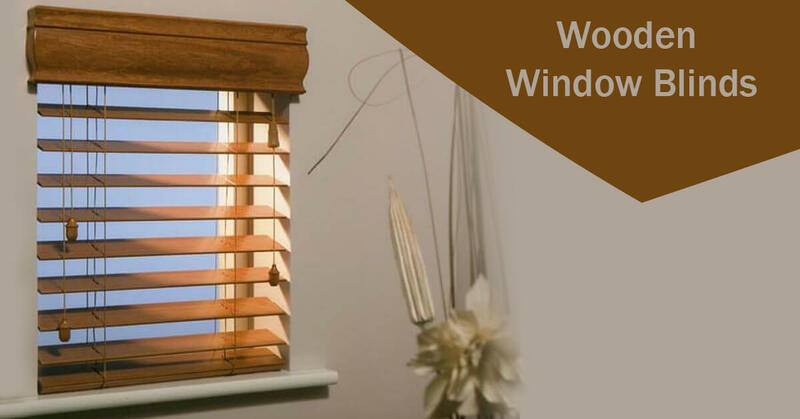 One of the main reasons for this enduring popularity lies in the natural elegance that wooden window blinds bring to any room. If you are a fan of the classy and traditional look that results from using mostly natural materials for your home décor, you are going to love wooden blinds. Their natural origins make them stand out in a world of artificial materials like metals, composites and plastics. And as if there wasn’t enough already to make them unique, no two wooden blinds have the same grain pattern and style. This ensures your particular window blind is unlike any other. The popularity of wooden window blinds is expected to grow for the foreseeable future. As the adoption of window treatments made from metals, plastics and composites grows, wooden blinds will continue to occupy a niche space. That’s because, for homeowners who want a combination of practicality, variety and exclusivity for their window treatment, wooden window blinds are the only option.